Media in China praise vows by Chinese and French leaders to build a "multipolar world", but note lingering differences on human rights, a high-tech export embargo and Syria. 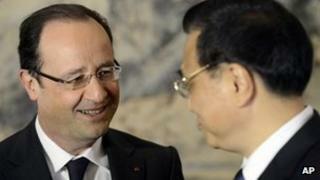 Global Times and other state media are highlighting French and Chinese promises to promote a new international "multipolar" order, during French President Francois Hollande's first visit to Beijing. "France sometimes has different ideas from the US. China may co-operate with France," Cui Hongjian, director of European Studies at the China Institute of International Studies, a foreign ministry think-tank, tells South China Morning Post. China Daily says Beijing and Paris signed 18 deals on Thursday, including deals for 60 Airbus planes and a nuclear project. But differences over some issues are likely to remain, notes Global Times. "France may say what they expect from China on issues like Syria, but China will choose to stick to its own principles," Prof Shi Yinhong at Beijing's Renmin University of China, tells the newspaper. A bilingual Global Times editorial hopes that Mr Hollande will not follow other European leaders in playing a "game" of seeking economic benefits from China, while still meeting with exiled Tibetan spiritual leader the Dalai Lama. "Currently, European politicians look increasingly like the yes-men of Washington's policies. Maybe the decline of Europe has contributed to this," the newspaper comments. In other international news, China's defence and foreign ministries on Thursday refuted foreign reports about Chinese border troops and military helicopters "intruding" across the line of actual control between India and China, China Daily reports. In Global Times, counter-terrorism expert Fu Xiaoqiang at the China Institutes of Contemporary International Relations, a state security-linked think-tank, accuses Indian media of stirring up an "anti-China wave" and a "China military invasion" scare to force China to concede in border talks. Zhang Liangui, a North Korea expert at a Communist Party school, tells Global Times that China has "really started to feel anxious" about tensions on the Korean Peninsula. "Beijing is, for the first time in decades, actively seeking measures to increase the consensus with Washington and Seoul on North Korea," Prof Zhang says. China's foreign ministry accuses the US government of having "no sympathy" after the US State Department called for a transparent investigation into violent clashes in Bachu county near Kashgar in the western part of Xinjiang on Tuesday, Global Times reports. Authorities are calling the incident a "terrorist" attack, but exiled Xinjiang activists have challenged Beijing's account of events. Internet users are demanding a public explanation on how 15 police and officials were killed during the Xinjiang stand-off, Hong Kong's Oriental Daily News reports. Some netizens are questioning why police were forced to "go it alone" without the help of the military. The Beijing News says stricter earthquake safety checks are urgently needed for rural homes after a State Seismological Bureau expert found that up to 90% of houses were damaged in one county after last Saturday's quake in Sichuan. Sichuan authorities, however, believe that buildings that were rebuilt after the Wenchuan earthquake in 2008 managed to withstand the quake without collapsing completely, Caixin reports. Meanwhile, Hong Kong's South China Morning Post flags up public concerns over a People's Daily report that foam and hollowed bricks were used to build a Hong Kong government-funded secondary school in quake-hit Lushan county. The first case of H7N9 bird flu has been confirmed in eastern Jiangxi province, while two new cases of H7N9 were reported in Zhejiang province and one in Henan province, says Xinhua. China's legislature has adopted a long-awaited tourism law banning excessive price hikes at scenic spots following floods of complaints by tourists in recent months, Xinhua says. A medical student at Shanghai's Fudan University was formally charged with intentional homicide yesterday for allegedly killing his roommate with poisoned water in their dorm room on 2 April, China Economic Net reports. The case has gripped the media and public's attention in recent weeks amid growing concerns over violence among the youth.